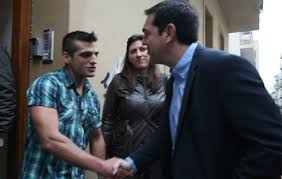 Main opposition Coalition of the Left SYRIZA leader Alexis Tsipras paid a visit to the school operated by the drug and alcohol rehabilitaton centre “18 Ano” on Saturday. He noted that the school belonged to a community that inspired young people fighting to regain their dignity. He pointed out that addiction was not an incurable disease and that addicts were not people with special needs but needed the support of the state in order to be rehabilitated. Mr. Tsipras said the process of education provided a useful tool in the effort, helping them rejoin society and preventing their relapse. “It is shameful for our country, for our culture, that we cannot find the miniscule funds necessary, such as 6,000 euros a year, and that this school…remains closed even today,” he added, saying it was indicative of the present government’s attitude to how the state should deal with those that were marginalized.